Natural Selection is described as “the differential survival and reproduction of individuals due to differences in phenotype”. To this, some add “blind, mindless, and purposeless environmental process” that nonetheless is imagined turning random genetic mutations into superior new features enhancing descendants’ survivability (fitness). Accumulation of these features supposedly turns one lifeform into another over time. Natural Selection seeks to explain the appearance of design in nature without appealing to a designer. This definition however fails the simplest test as different phenotypes survive different environments thus delinking phenotype from survivability. In a small farm, only organisms closely related to their wild cousins survive, but agribusinesses select for chickens with oversize breasts and research labs select for populations with specific genetic mutations requiring tight environments to survive. Although all these have different phenotypes, they do not possess an intrinsic phenotype “fitness” independent of the environment. In addition, who decides what is natural and what is not? Darwin considered domestication natural enough to include it as supporting argument. And as far as “blind, mindless, and purposeless”, all these are impossible to prove in addition to being utterly incompatible with the anthropic concepts of “better adapted” and “better fit”, both of which cannot be evaluated independent of survivability anyway. Natural Selection is supposed to tie both ways survivability with phenotype, but this leaves out the environment which not only affects survivability directly, but also phenotype, itself a sum of genotype plus the environment, and even genotype that is a recurrent function of previous genotypes and the environment again. So in the end, survivability is a recurrent function of genotype, an infinite continuum of environments, and other unknown factors. While survivability can be measured as can be the individual genotype, measuring a population’s genotype is daunting at best, and the impact of the ever changing environment is simply impossible to evaluate. Phenotypes are impossible to define and measure in entirety even for one individual and, in addition, phenotype changes constantly from birth to adult to old age. We do see genetic mutations (unknowable if random) and we do know that, given a similar environment, extreme genotypes reduce survivability, yet we also know that a large variety of genotypes survive just fine in any population. Fitness is never defined independently of survivability – this renders the fitness concept redundant especially since survivability can be measured while fitness cannot. Evolutionary Fitness is defined as the quantitative representation of natural and sexual selection (reproductive success) of a genotype or phenotype in a given environment. “Survival of the fittest” is interpreted as: “Survival of the form (phenotypic or genotypic) that will leave the most copies of itself in successive generations.” Not only is survivability the only measure, but survivability also changes with the environment. Natural Selection is Intelligent Selection which is always done by an Intelligent Selector such as Darwin’s breeder which is an intelligent and willful player that takes intentional actions to reach preset goals. Predators, plants, birds, insects or bacteria, all show intelligence and the willful pursuit of predetermined goals. When interacting with the inert environment, organisms self-select rather than being selected by this environment. As soon as the organism dies and becomes part of the lifeless universe, all selection of that entity ceases. Selection is limited to a narrow set of possible adaptations – what is not there, cannot be selected. Among the most common adaptations are body color/size/shape, hair type, antibiotic/chemical resistance, and behavior, and even these are limited in scope. Farmers would like to grow walking chicken breasts the size of hogs that grow much faster and come in various flavors, but this is not happening despite their best efforts. Antibiotic resistant bacteria still cannot survive extreme temperatures and chemical concentrations and their resistance decreases when the stimulus is removed. Rabbits cannot turn green when hopping over grass and white just over winter, despite the clear advantage such camouflage would bring. Size of tails, horns, beaks, trees, etc. are all stable over time as tradeoffs limit their growth. Human intelligence, flying, swimming, venom, and all other desirable capabilities remain restricted to specific organisms. Domestication has greatly helped mankind’s progress, but it has not changed the nature of the target animals and plants despite intensive efforts to accelerate their evolution. Instead, humans only enhanced the built in characteristics of domestic organisms and simply did without – a huge civilization disadvantage – when those plants and animals were unavailable. Hence, selection does not “design”, is limited in scope to a few available characteristics, and is reversed as soon as the selection pressure ends. Extinct organism were not flawed and their features were not “selected away”. Most characteristics of the extinct survive just fine in current organisms of which some changed so little over time they are called living fossils. Sure, the mammal eye might provide superior vision to insect eye, but nothing comes for free and tradeoffs ensure both survive. Organisms that have completely vanished cannot be characterized as flawed and it would not take much imagination to see them thriving in a current landscape. The environment may have changed dramatically over time, however on a macro scale, the environment affected all organisms making the “natural selection” explanation highly doubtful regarding why some organisms survived in their old form, why some went extinct and why others would survive in a changed form. Humans and apes shared the same environment in Africa so common genotype would not have caused our dramatic differences just as lions are not that different than leopard, the cheetah and the others. What if anything should replace Natural Selection? Humans have applied the most intensive and targeted selective pressure on us and others with great results for our existence. Yet we have not transformed even one organism into another – not even the lowly eColi after decades of laboratory work (Lenski). Our dogs are still basic canines and our cats are still basic felines, not much different than their wild cousins. If anything, we had to adapt to them rather than them to us. The finch, the moth, the antibiotic resistant bacteria are still the original organisms, their hailed changes having reverted or proven simple adaptations. We are no smarter, more powerful or longer living (in absolute) than out primitive ancestors. Selection is not transformative, much less creative. Humans would apply the Natural Selection method if feasible. But we don’t because it isn’t. A Natural Selection software would use a random generator and a selection criteria to maximize survivability in an available niche. For instance, a family vehicle should optimize the transport function (survivability) given a set of environmental constraints (regulations) and an existing design as starting point. Random minute changes could be tested and retained if the transport function is improved. However, this method can only remove minor oversights but will never create any new designs. Any significant departure such as a new fuel, material or environment either results in a suboptimal design, or requires a cascade of changes to improve the survivability function. That is why the auto industry, like most other industries, introduces minor redesign annually and major revamps every few years. And while even the minor improvements must come in harmonized packages rather than one off (to reduce negative ramifications), in the absence of those major redesigns a firm would shortly go extinct. 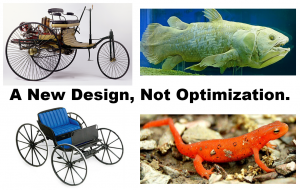 Designs do not transform into better designs without crossing an inevitable optimization gap. Given a certain environment, once a design is optimized for a certain function, it becomes suboptimal as soon as the function, the structure, or the materials changes. Until the new design is optimized for that particular change, it remains inferior to an old design already optimized to that environment. 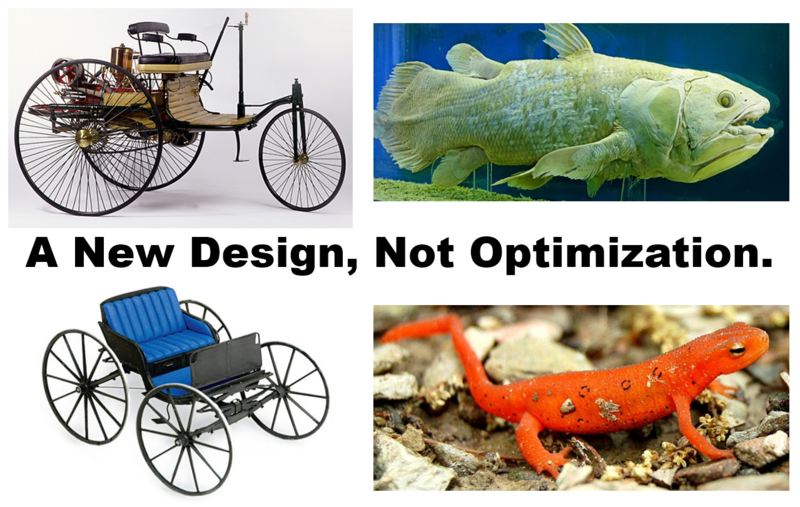 Humans optimize new designs (with multidimensional differences from previous versions) conceptually before abruptly replacing old designs. A Darwinist biologic gradual design transition would thus be impossible hence never observed in nature. Had the compound eye been optimized first, a transition to non-compound eye would inevitably had to be suboptimal for a while and vice versa. Only if all eye designs had started from the same point, each following an independent path and at the same pace would we have so many different designs today, each optimized for its function. This however implies a coordinated original grand design incompatible with Darwinian evolution. Con: What about organic design? Isn’t that natural selection at work? Pro: No. This is just iterative optimization of a given design. In this case, the wing shape, the material, the environmental forces and the optimization target are all given. The algorithm will not generate a new wing shape or material and it will stop converging as soon as the environment is less than perfectly defined. In addition, this design is radically different from the previous one, and the next iteration will certainly be radically different than this one (no gradualism). Con: You just don’t understand natural selection. Pro: If “natural selection” were hard to understand it would not be taught to young children. Instead, “natural selection” is more like very bad street magic where the bus is covered with the cloth and we then are asked to imagine it disappeared without even removing the cloth and showing us the empty space. This entry was posted in Evolution by Nonlin.org. Bookmark the permalink. Was Darwin dumber than his critics think? No. Things you (especially you) don’t understand are not necessarily stupid. Plant and animal breeding is not the “artificial selection” described by Darwin and has nothing to do with any natural process. It’s exactly the “artificial selection” described by Darwin, and all he examples are taken from plant and animal breeding. Either your claim here is ridiculous on its face or you have misstated it. Breeding requires a desired outcome, selection (just a minor step!) and isolation of successive generations of promising individuals, active mating or artificial insemination, optimization of growth conditions for the selected individuals, and/or other genetic technologies. Without most of these active steps nothing happens. All those steps are part of artificial selection. Perhaps you are merely fixated on a single word? Chihuahua and Poodle have no superior survivability to common dog or wolf, but happened anyway because humans worked hard to make them possible. They have superior survivability (well, actually superior reproductive success) in the artificial selective environment, the one in which “humans worked hard”. That’s artificial selection. But no one ensures all these active steps in nature. To take only one example, how could humans have “evolved” distinctly from chimps when no one separated each and every new generation based on a teleological model? Humans didn’t evolve from chimps. The usual model of speciation, which is probably how human speciation happened too, begins with geographic separation of populations by some barrier. No teleological model is necessary. Why did the proto-human not mate back with his/her regular chimp cousins to put an end to the split? Once more, humans are not descended from chimps. According to some research, there was occasional introgression from the chimp lineage to the human lineage for about a million years after the main separation. And that main separation was probably geographic, a barrier crossed by few migrants. Who and how could have separately optimized conditions for both chimp and human so both lineages survived in what looks like very much similar environments? There is no “who”, just nature. The environments presumably were not all that similar, human ancestors living in more open areas, but even if they were, different solutions to the same problems can evolve in separated populations. ‘Selection’ of both “artificial” and “natural” type is thus the wrong word and should be phased out. So all that was just about the word? A pointless semantic argument? Why bother? John Harshman: Chihuahua and Poodle have no superior survivability to common dog or wolf, but happened anyway because humans worked hard to make them possible. Who said anything about macroevolution? Jerry Coyne doesn’t believe what you claim, nor do I. Nor did anyone, ever. Get a clue. Also, learn how to quote. You have combined something I said with something non.lin said and attributed the whole thing to me. John Harshman: Plant and animal breeding is not the “artificial selection” described by Darwin and has nothing to do with any natural process. Do you deny that breeding is an active and teleological process that takes intelligence and effort not just once but every generation for many generations? Do you deny that selection is only a minor step in breeding, hence the correct name for the activity is indeed ‘breeding’ and not ‘artificial selection’? Do you deny that humans worked hard AGAINST the tendency of dogs to mate haphazardly and thus to revert over generations to the original dog/wolf (see feral dogs)? Who separated and did all those other necessary activities EACH GENERATION to get to humans? Do you have any proof whatsoever of “geographic separation” of hominids? And how about EACH GENERATION? Would you agree there’s no significant divergence between chimps and bonobos since Congo River 1.5 mya? Compared to humans, would you agree there’s no significant difference between Nsungwepithecus gunnelli and modern chimps over 25 mya? Honestly, do you think the environment can be responsible for the wonderful distinction between humans and apes? Why don’t you look at other animal families and see that the environment makes little difference. Look at bears, felines, canines, bovines, etc. And many times related families occupy the same environment. In your opinion, was my comment about semantics or about Darwin being dumb? Of course Darwinism is your religion so there’s no chance you can be objective about it… even when the evidence against it is too blinding to ignore. No, no, and no. Why? Nobody. The separation, as I have said, was natural, probably geographic. There is no direct evidence for that separation, but it’s how most speciation works. No proof, but it’s how speciation commonly works. The same geographic barrier persists through time; nobody has to add one each generation. No, I wouldn’t agree, and I’m not even sure what you’r trying to say there. No, that would be a nonsensical claim. Nonlin.org: Honestly, do you think the environment can be responsible for the wonderful distinction between humans and apes? Why don’t you look at other animal families and see that the environment makes little difference. Look at bears, felines, canines, bovines, etc. And many times related families occupy the same environment. I’m afraid this just shows that you have no clue about evolutionary responses to environment or about the disparity within mammalian familes. In my opinion, your comment was nearly incoherent. What exactly do you mean by “Darwinism”? Have you looked at other animal families to see that the environment makes little difference? Have you looked at bears, felines, canines, bovines, etc. and noticed how much they resemble each other regardless of the environment? …and how too often related but different families occupy the same exact environment? All these make perfect sense, NOT! Why don’t we call your beliefs “science” and force-feed it to little children? Maybe they’ll turn into Darwin’s zombies too. I would be happy to discuss all this with you, but you will have to move beyond just repeating your mantras and turning my replies into strawmen. Looks like you’re out of ideas. It’s OK, take your time. You do realize that, “mantras” and “strawmen” accusations make a very weak reply, right? Nonlin.org: You do realize that, “mantras” and “strawmen” accusations make a very weak reply, right? I’m willing to accept the possibility that you don’t realize you’re doing it, if that helps. John Harshman: I’m willing to accept the possibility that you don’t realize you’re doing it, if that helps. Still out of ideas? No worries. Take your time. You’ll be waiting some time. You’ve demonstrated that you cannot defend your ideas, you are not even interested in dialogue. So, why would anyone bother. You can walk away knowing you’ve “won” and that your ideas remain undefeated. You don’t need to worry that your ideas are literally only yours, I’m sure the truth of your ideas will spread and take over one day. OMagain: You’ll be waiting some time. You’ve demonstrated that you cannot defend your ideas, you are not even interested in dialogue. So, why would anyone bother.